We’ve made Tina’s former mother-in-law’s recipe many, many times. If you don’t have 6 or 7 bananas, don’t worry, it’s fine even if you only have 2 or 3. Preheat oven to 350°. Cream butter and sugar. Add one egg at a time, mixing between additions. Mix flour, baking powder, soda, and salt. Add to batter. Mash bananas and sprinkle with a little lemon juice. 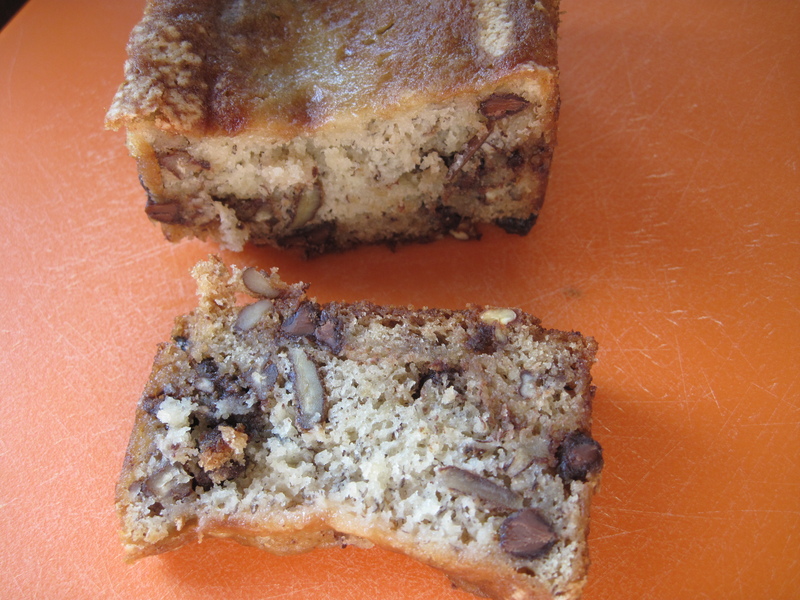 Add bananas and nuts to batter. Pour into loaf pans and bake 1 hour or until done. Pictures of Papa – Charles Franck LaBiche Sr.
Charles Franck LaBiche, Sr., and Marcus Crescentius LaBiche, Sr.
Charles Franck LaBiche, Sr., sitting under umbrella. Mirza Trist LaBiche right background with hat. Everybody else unidentified. 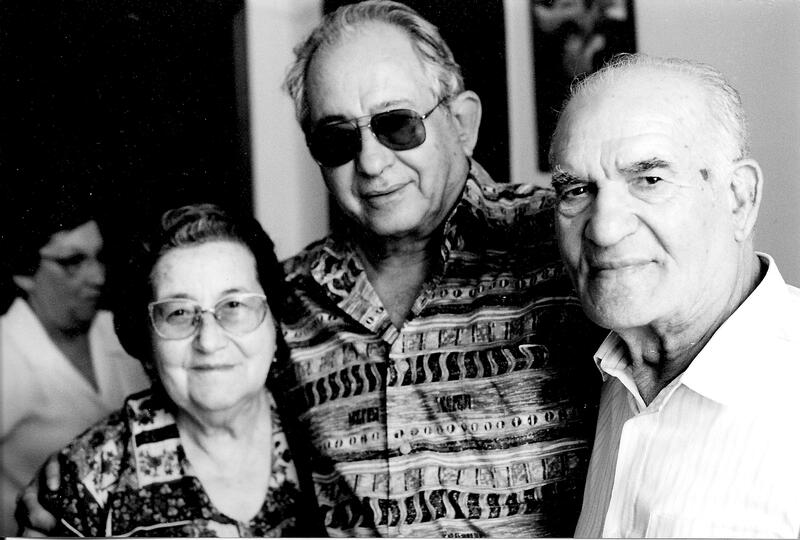 Armand Anthony Legendre, Sr., at left. 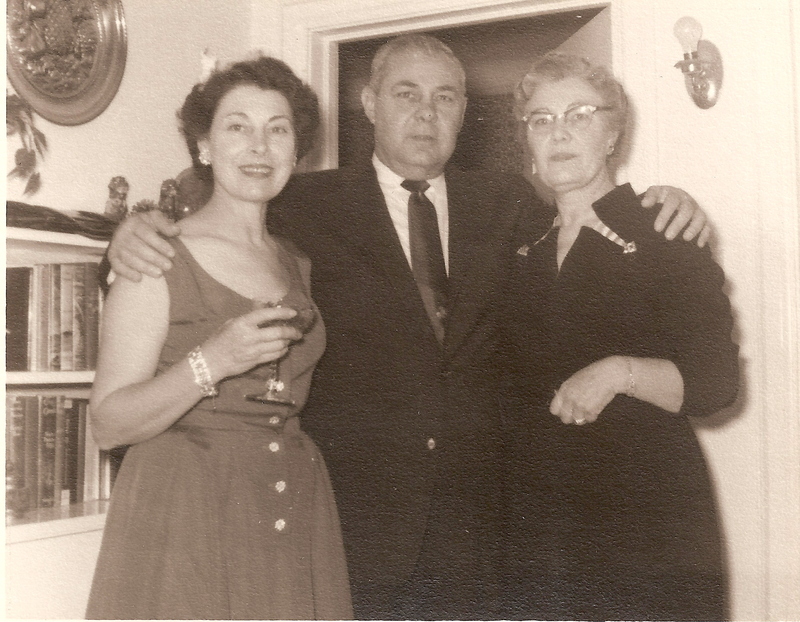 Charles Franck LaBiche, Sr., at right. 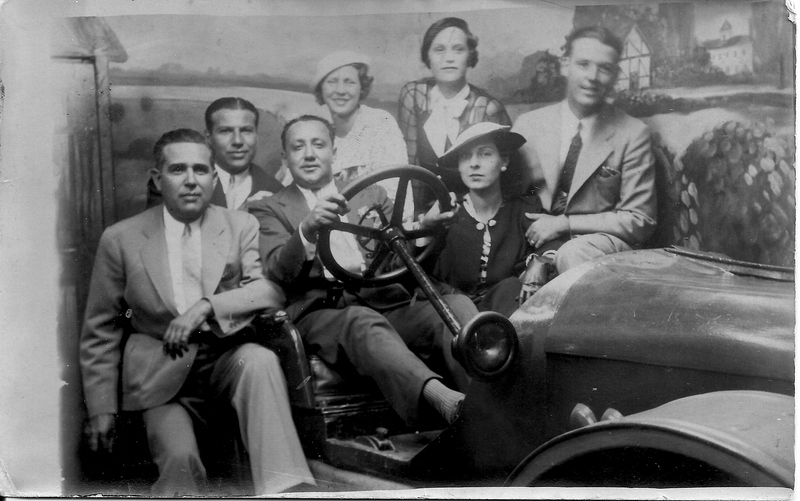 Mirza Trist LaBiche to right of steering wheel, seated. 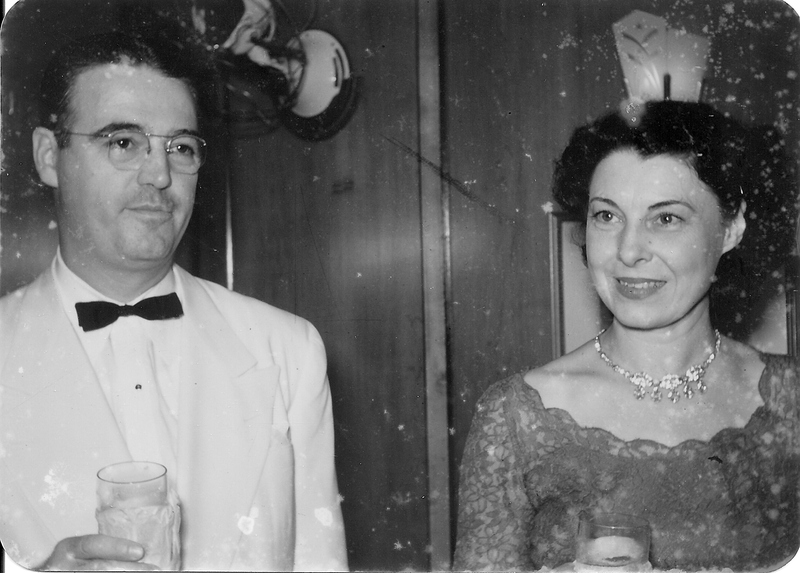 Ruth LaBiche Legendre to left of Charles LaBiche, standing. The rest unidentified. 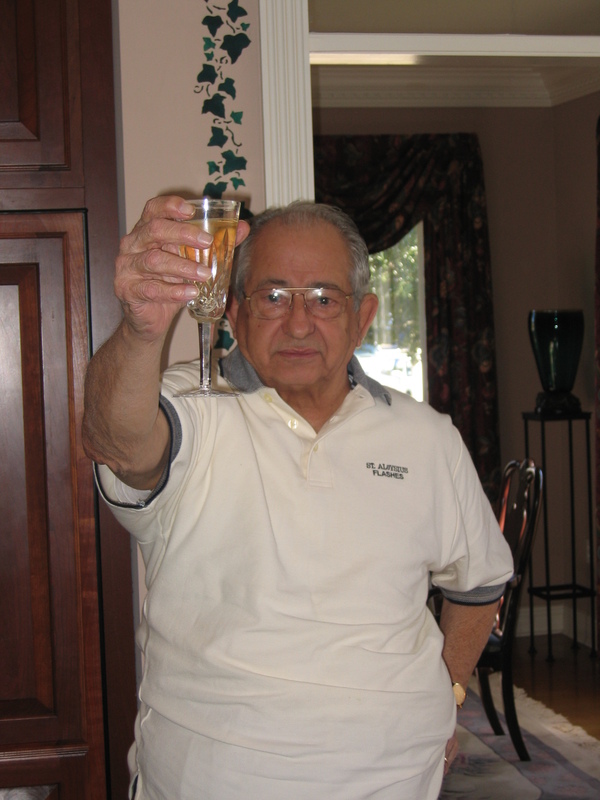 My Papa died when I was 7 years old, so all of the photos of him are from quite a while ago. 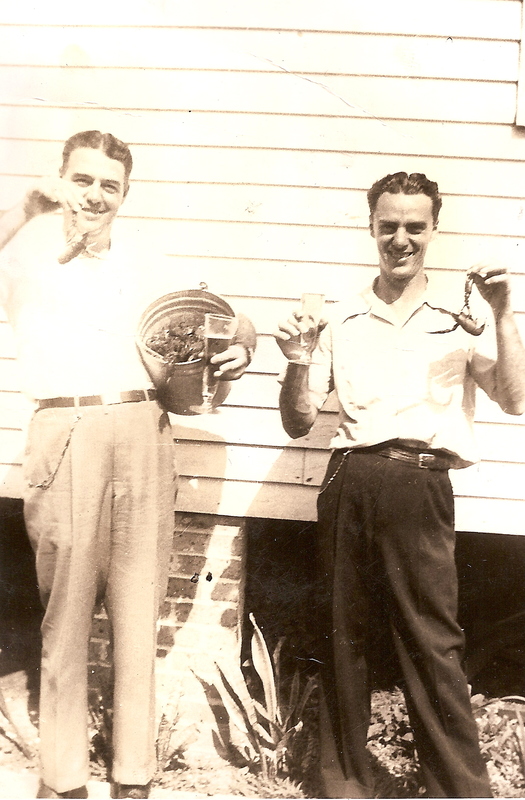 One of my favorites is him with Uncle Marcus (his brother – actually my Great Uncle) holding boiled crawfish, and a glass of beer. 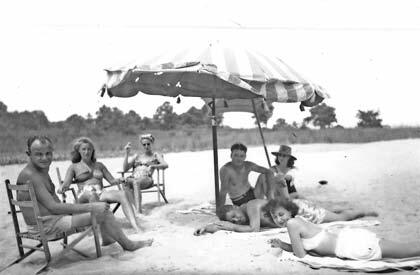 Mama said that this photos was taken in the ’40s. Papa was a golfer, and I am happy to have some of his golf trophies. I had even more, but my car was broken into on Port Street in the ’80s, and a whole box full was stolen. I’m sure they didn’t mean as much to the thief as they did to me. Aunt Ruth was Papa’s sister. 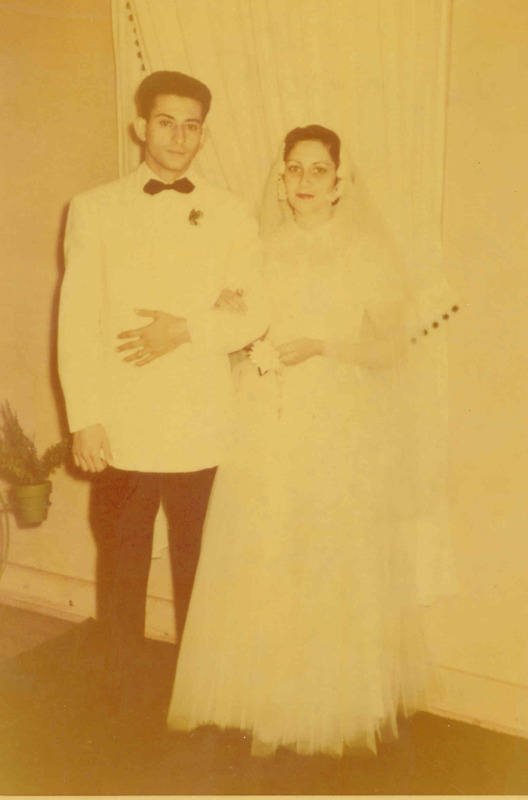 Papa was the Men’s Department buyer and Aunt Ruth was the Ladies Department buyer for the family clothing store, LaBiche’s. I believe that Aunt Ruth’s husband, Armand Legendre, was the Shoe Department buyer. The whole bunch of them would go to New York a couple of times a year on buying trips. More photos of Mamie …. 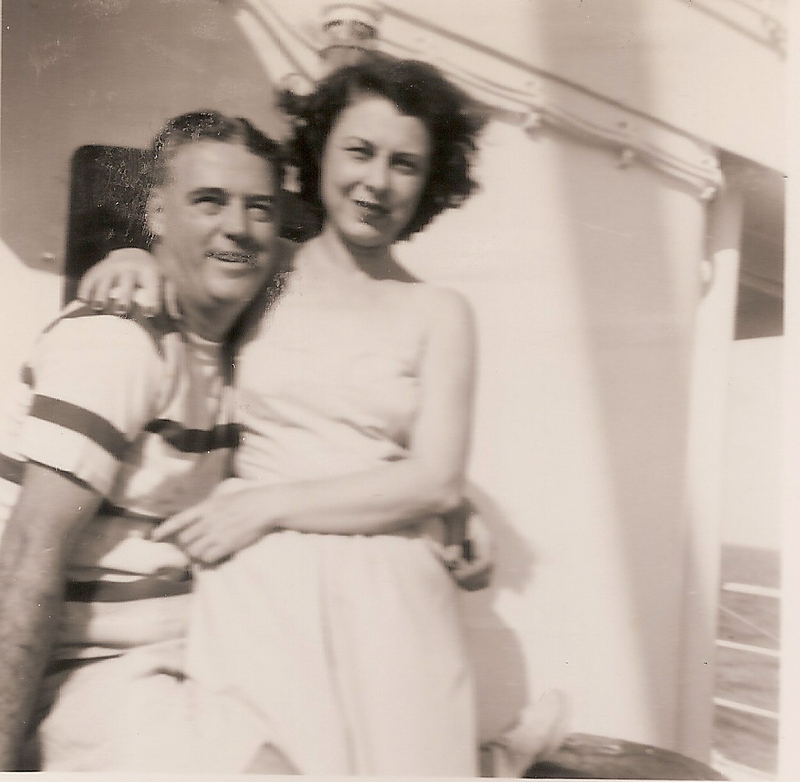 These are photos of my maternal grandparents, Charles (Papa) & Mirza (Mamie) LaBiche. 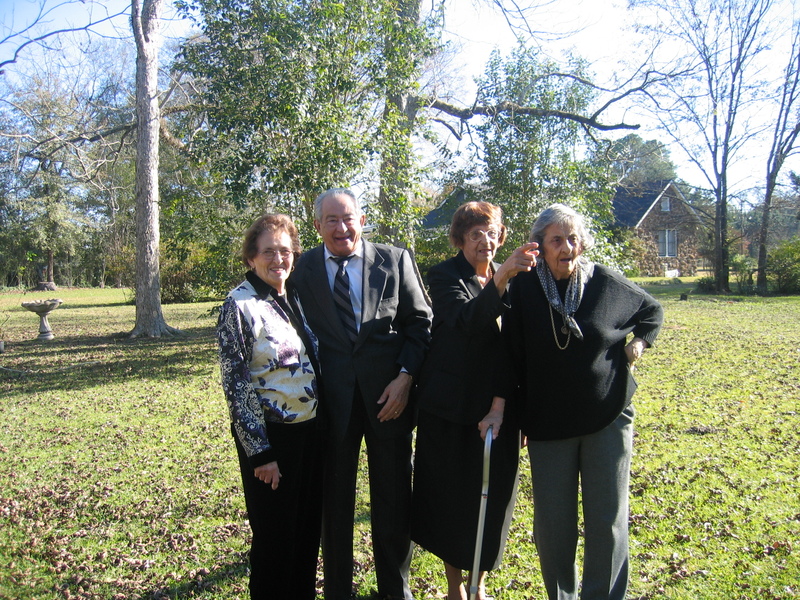 The last one is Mamie with her brother Nick Trist and her sister Juanita Valadie. I’ve chosen these photos to share because all of these people are no longer with us, so I can’t get their permission! 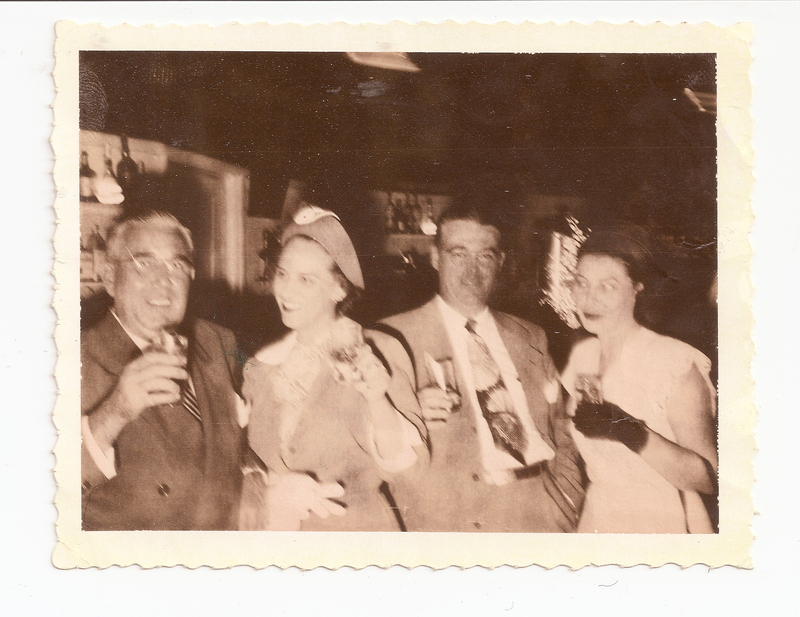 I’ve been asked repeatedly why I didn’t identify all the people in the photographs. I decided that it was easier to get photo releases from everybody if I didn’t put names in the book. I was afraid some people would be uncomfortable with their names in the book, but wouldn’t mind an unidentified photo. Since you asked, I guess I’ll identify some. I’ll start with myself. 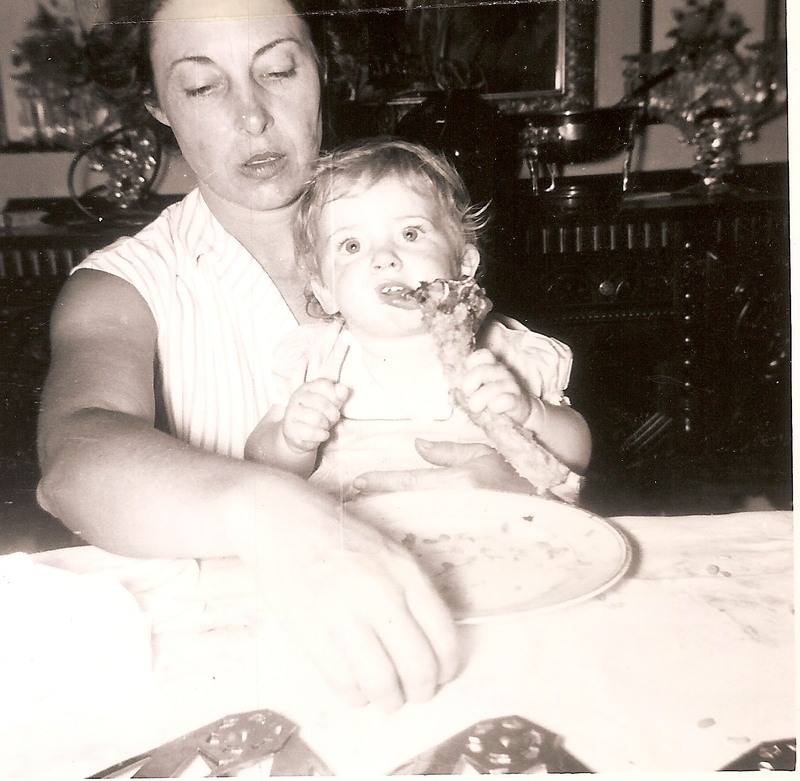 This is a photo I found in my baby book, identified as “Things Denise likes at 1 year — chewing on bones.” I think I liked sitting in Mamie’s lap chewing on bones. 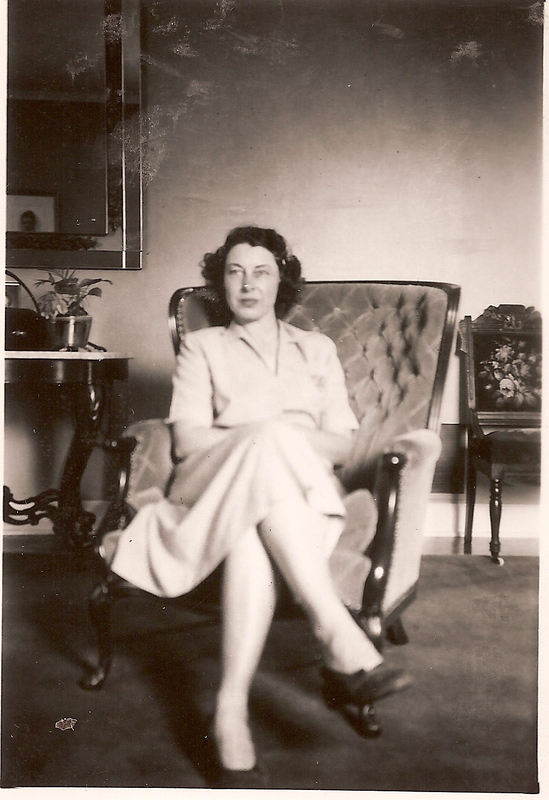 Mamie was my grandmother, Mirza Trist LaBiche. She lived from 1907 until 1998. She was a great cook, and people remember her for her Bread Pudding with Whiskey Sauce (in the book) and her Stuffed Artichokes (also in the book), among many other things. She loved Fruit Cake (yes, that too is in the book) and she and I would get together each year and bake them for ourselves and for other People Who Love Fruit Cake. I still make fruit cakes every year, and think of her when I’m doing so. The list of People Who Love Fruit Cake has grown a lot over the years.